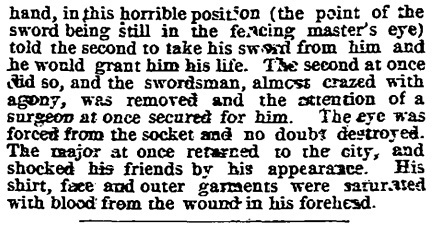 A gory 1870 saber duel in St-Louis. In 1870, two men met in the outskirts of St.Louis for a duel. Major Henry Keith and Captain Vanstein both Civil War veterans from the Union army fought it off using sabers. Here is the description of this duel as published by the Spingfield Republican on July 25th 1870.